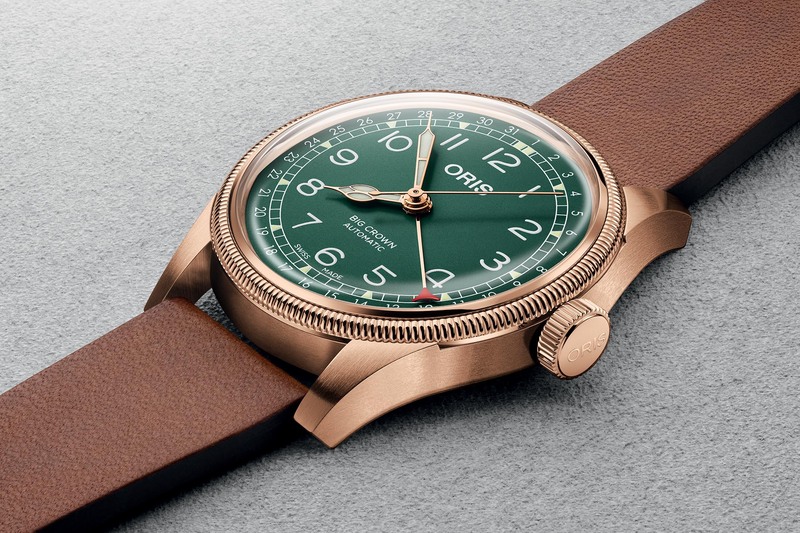 Oris Marks the 80th Anniversary of their emblematic Big Crown Pointer Date with a Special Bronze Edition. 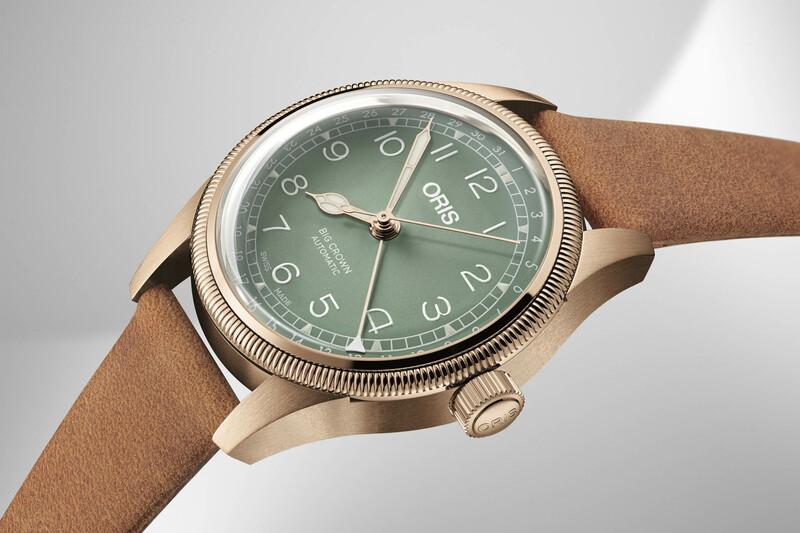 Oris launched a significant pilot’s watch back in 1938 and it has become one of the brand’s iconic pieces. The original Big Crown Pointer Date had an oversized crown to allow easy adjustments for airmen with gloves. 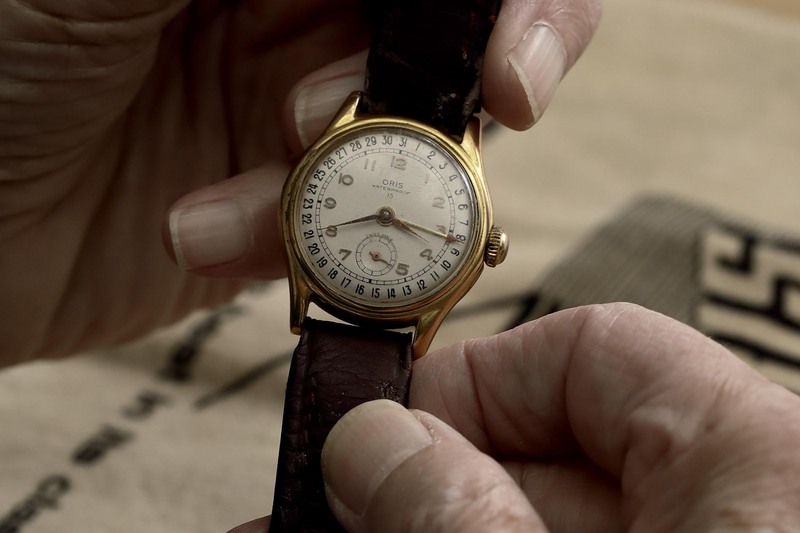 It also had the original date complication (patented in 1915 by A. Hammerly) that used a central pointer hand instead of the familiar date window (also patented by A. Hammerly). 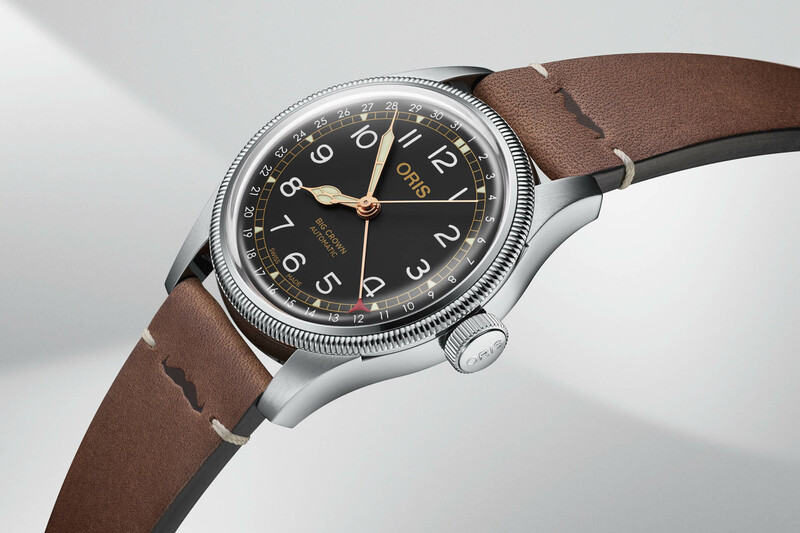 The watch was an affordable, reliable tool for pilots and has remained in production for 80 years. During the “Quartz Crisis” of the 1980s, the Big Crown Pointer Date helped Oris weather the storm and remain relevant, and is arguably the most important line in its portfolio. 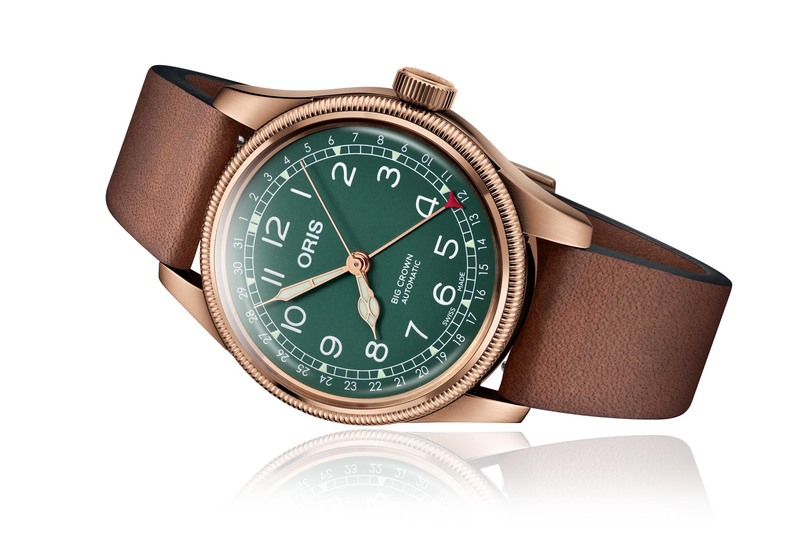 The company is celebrating this remarkable achievement with a special 40mm bronze edition with a green dial. 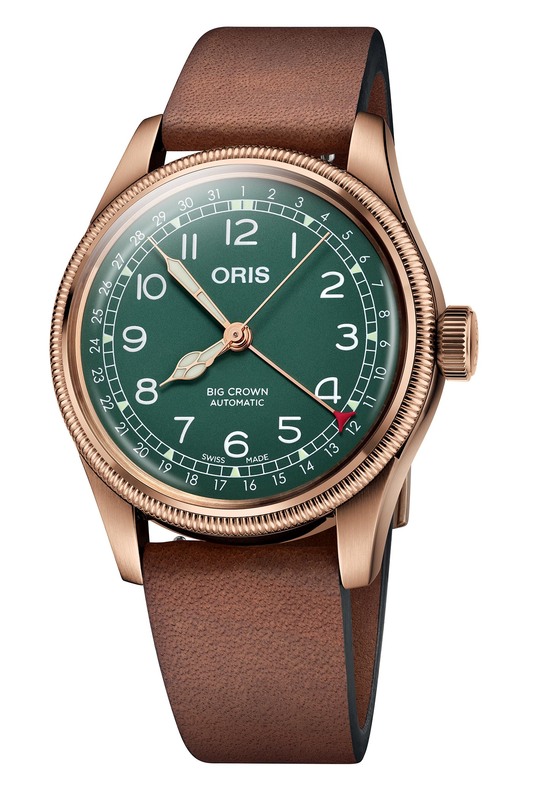 This follows the bronze 36mm Big Crown Pointer Date that launched back in March of 2018. 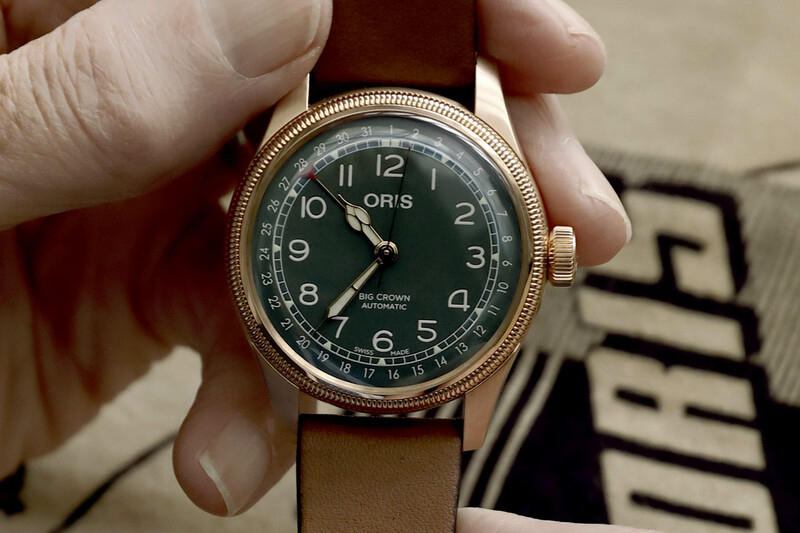 The Original 1938 Oris Pointer Date. 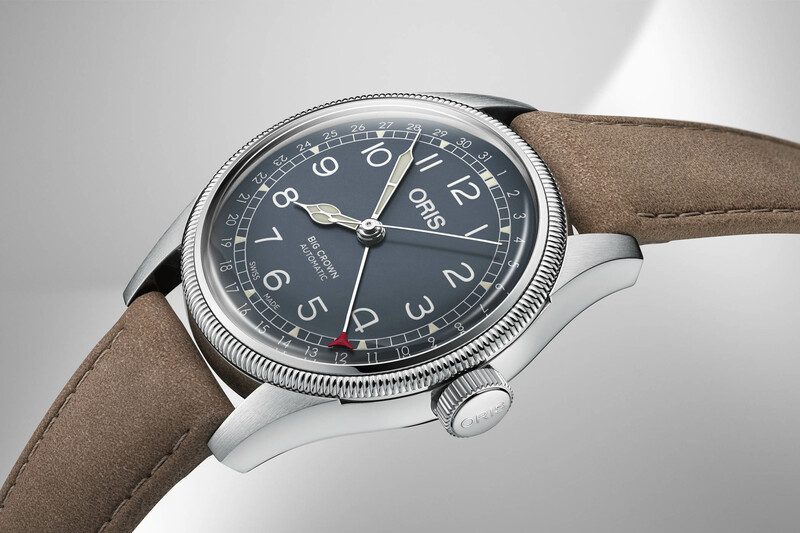 The pointer date complication has become a popular feature for Oris and uses a central hand that rotates around the dial, pointing to the date at the dial’s outer edge. In light of the 80th anniversary, multiple editions have been released this year, including the limited steel Movember Edition (supporting the Movember foundation that helps fight major health issues facing men) and a stainless steel model that’s a more conventional version of the new bronze edition. 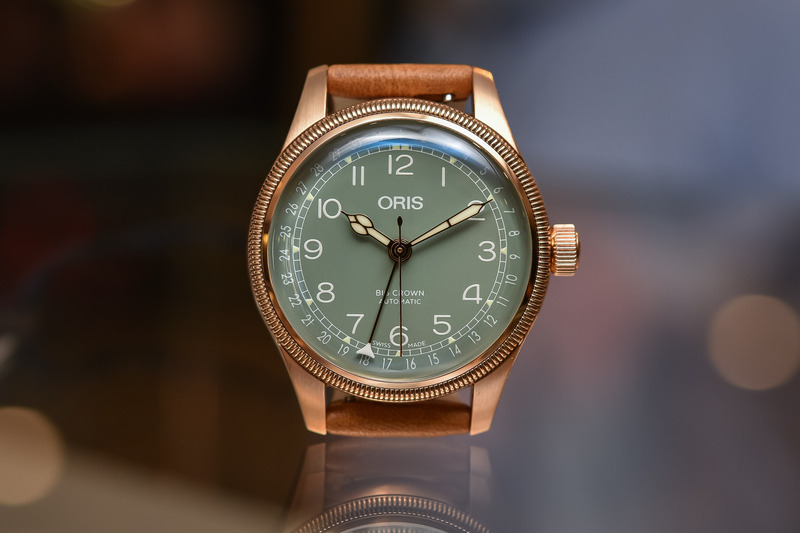 Founded in 1904, Oris has always focused on producing affordable, practical yet stylish watches “that serve a purpose.” The Big Crown Pointer Date series definitely meets that criterion. The 40mm bronze case has a fluted bezel and an oversized screw-in crown (water-resistant to 50m). Bronze will oxidize over time and a patinated aesthetic will take hold – an increasingly popular choice of material next to the more common stainless steel. The domed sapphire crystal has an anti-reflective coating and the screw-in caseback is actually stainless steel (for hypoallergenic reasons) with a mineral glass exhibition window. The dial is matte green with Arabic numerals spanning the (not quite) outer edge and filled with white Super-LumiNova. The outermost edge is printed with the 31 days of the month that the central pointer hand marks, while a minute track sits between those and the Arabic numerals with 5-minute markers filled with lume. The gold cathedral hour and minute hands match the bronze case (as does the seconds hand) and are also filled with Super-LumiNova, while the pointer date hand has a specially shaped red tip. ORIS is printed at the top with BIG CROWN AUTOMATIC printed above 6 o’clock. The four-hand setup could easily be confused for a GMT watch at first glance, but it’s simple to use in practice. The beating heart is an Oris 754 calibre automatic, which is based on the Sellita SW200. It has 26 jewels, beats at 28,800vph (4Hz) with a 38-hour power reserve. Functions include central hours, minutes, seconds (hacking) and a date pointer. Seen from the exhibition caseback, Oris finished most of the rotor in red with SWISS MADE ORIS HIGH MECH engraved at the outer edge. The movement is otherwise undecorated but still looks nice under the glass. The 20mm dark brown leather strap has a bronze buckle and Oris says it’s made with sustainably-sourced and produced materials. Although this is a special bronze edition, there’s no indication that it’s a limited edition piece and is likely a standard production model. 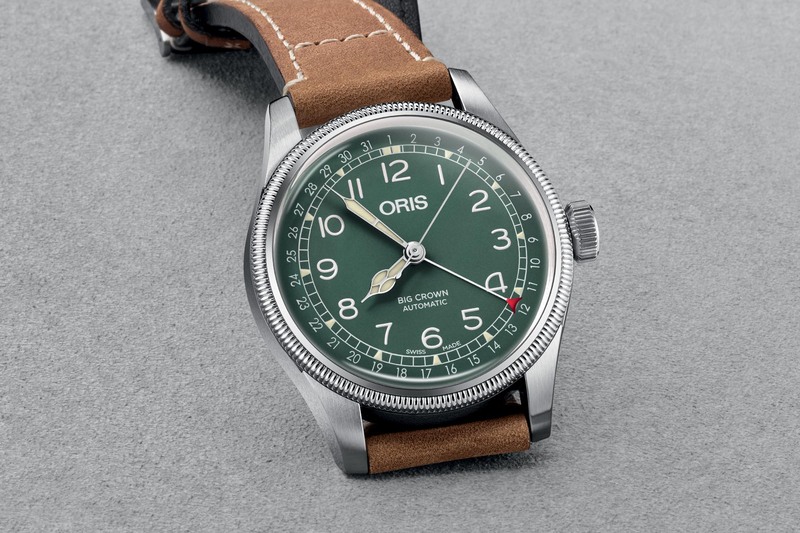 The watch sells for CHF 1,900 (USD 2,000) and can be purchased at the Oris website or participating retailers.